iScienceSearch (iSS) is an Internet search engine for chemists, it supports both chemical structure and text-based searches. When you first access the site you get the following popup window, which is useful to know, however it does appear every time you access the site, a check box for “Don’t show the message again would be helpful”. The main search page is pretty self-explanatory, and provides access to a variety of types of search via a collection of buttons. On my desktop machine in a landscape view it all looks fine but the page does not reformat nicely when the browser window aspect ratio is changed, this is slightly surprising since it accommodates landscape and portrait on the iPad very smoothly. 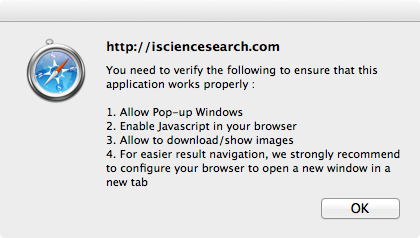 This may be a function of the desire to support older web browsers. You can use iSS to do simple text based searches as you might do in Google, but in the background the search query is intelligently extended. For instance, if you search by name, then the search is extended automatically when possible to search by other synonyms, CAS Registry Number, and structure (InChIs, smiles, molfiles). This also applies to structure based searches so you get answers in databases that you cannot search by structure, even if you start with drawing a chemical structure. iScienceSearch presently searches more than 60 free chemical and pharma relevant databases and there is a full listing here, the list includes Zinc, ChemSpider and Chemical lookup service, PubChem, ChEmble, DrugBank together with PubMed, a variety of journals and abstracting services. Usefully the text box also accepts SMILES strings for searching, this could save the effort of drawing the structure. I particularly like having a progress bar to update the user on the status of the search, so after using “Emend” as the search string you see the following comments. The entire search took around 10 seconds. The results for all the data sources are presented in a single page with links to the individual databases. These links can be sorted, filtered or grouped. 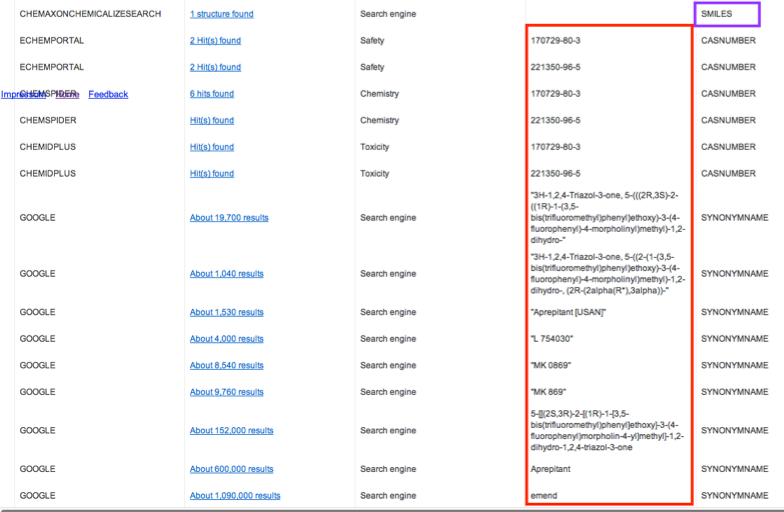 As you can see in the page below the search for “Emend” returned a variety of synonyms including chemical name, CAS Number and company codes (all highlighted in red). In the purple box we see the results of a chemical structure based search using a SMILES string. You can draw a structure for searching, or if you now a name or identifier (including a SMILES string) you can use the “Find structure for name” button to run a search to find the structure. As far as I can tell the initial search is for an exact structure match, however the results page does allow you to modify the search. 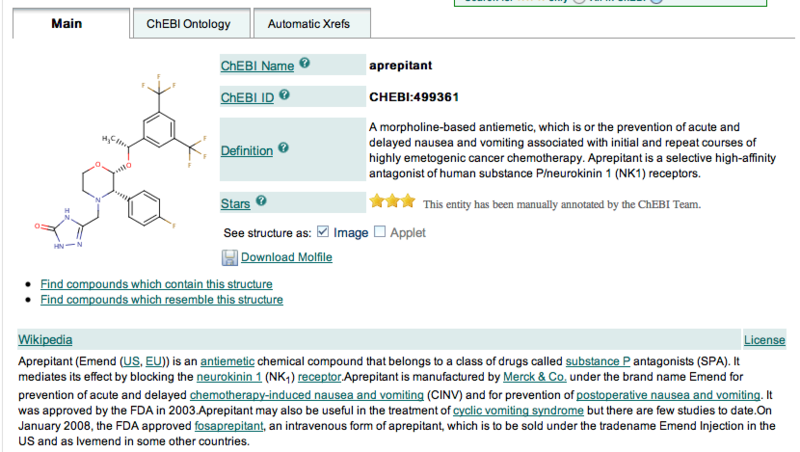 There is also a link to Chemicalize.org which gives access to chemical properties. It is also possible to use PASS (Prediction of Activity Spectra for Substances) to evaluate chemical structures, PASS is a software product designed as a tool for evaluating the general biological potential of an organic drug-like molecule. PASS provides simultaneous predictions of many types of biological activity based on the structure of organic compounds. Thus, PASS can be used to estimate the biological activity profiles for virtual molecules. The programme works by comparing the similarity between the input structure and compounds of 1244 known biological activities. The biological activities range from molecular targets (e.g. 5HT1a) to disease symptoms (e.g. Psychosis). I’m not sure I’d want to pass potentially patentable compounds to the site but it might be useful for exploring potential activities for known compounds. In summary this looks to be a very interesting starting point for chemistry based searching, and talking to the developers it sounds like they have interesting plans for its future development.